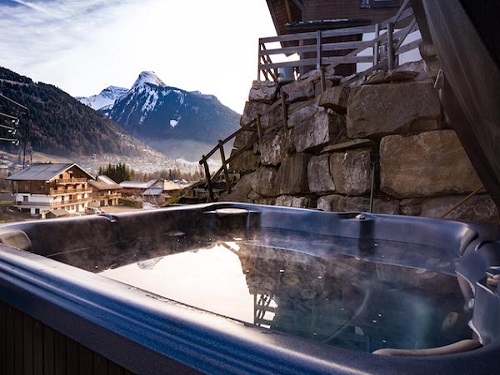 NOTE: Properties listed here are typically rented on a whole property per week (pw) or a per person per week (pppw) basis, and payable in the chalet owners currency of choice. If in doubt please drop us an email to confirm. *To aid search comparison the prices quoted here are pppw or an averaged pppw based on max occupancy, and where necessary have been converted to £ (GBP). Whilst every effort has been made to accurately display the owners rental rates and availability, mistakes do happen, and rates can be subject to change by the owner. Therefore these rates should be taken as a guide only. Final costing must be agreed and confirmed with the owners or their representatives before booking. 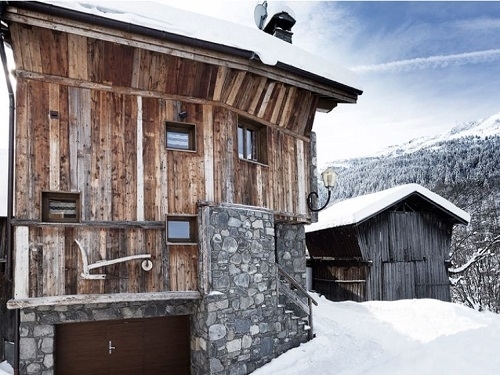 A 5-bedroom ski chalet which can sleep 10, situated in the ski resort of Les Menuires in France. Chalets 181 has a Sauna, Hot tub, Fireplace, TV and Wifi, and is available for holiday rent on a Catered basis. This 6 bedroom ski chalet is located in the French resort of Les Menuires. Available on a Catered basis, Chalets 192 can sleep upto 16 people. This ski-in ski-out chalet also features a Hot tub, Fireplace, TV and Wifi. A 1-bedroom apartment which can sleep 6, situated in the resort of Les Menuires in France. Le Villaret has a TV and Wifi, and is available for holiday rent on a Room only basis. Offering holiday accommodation in Les Menuires on a Room only basis, Balcons DOlympie is a 1 bedroom apartment that can comfortably accommodate 6 people. The property also features a TV and Wifi. Les Asters is located in the French alpine resort of Les Menuires. This summer alpine apartment has 1 bedroom and can accommodate upto 6 people on a Self catering basis. The property also features a TV and Wifi. Offering holiday accommodation in Les Menuires on a Self catering basis, Necou is a 1 bedroom apartment that can comfortably accommodate 6 people. The property also features a TV and Wifi. Les Lauzes is located in the French resort of Les Menuires. This apartment has 1 bedroom and can accommodate upto 5 people on a Room only basis. The property also features a TV and Wifi. Armoise is located in the French resort of Les Menuires. This apartment has 1 bedroom and can accommodate upto 5 people on a Self catering basis. The property also features a TV and Wifi. This 1 bedroom apartment is located in the French resort of Les Menuires. Available on a Self catering basis, Lac du Lou Chaviere Peclet can sleep upto 5 people. This apartment also features a TV and Wifi. Featuring a TV and Wifi, Les Melezes offers comfortable holiday rental accommodation in Les Menuires on a Room only basis. Les Melezes is a 1 bedroom apartment that can comfortably accommodate 5 people. Featuring a TV and Wifi, Ski Soleil offers comfortable holiday rental accommodation in Les Menuires on a Self catering basis. Ski Soleil is a 1 bedroom apartment that can comfortably accommodate 4 people. This 2 bedroom apartment is located in the French resort of Les Menuires. Available on a Self catering basis, Grande Masse can sleep upto 7 people. This apartment also features a TV and Wifi. Le Jetay is a 2 bedroom apartment that can comfortably accommodate 6 people. Conveniently located near to the pistes of the French resort of Les Menuires it is available on a Self catering basis. The property also features a TV and Wifi. La Boedette is a 1 bedroom apartment that can comfortably accommodate 6 people. Conveniently located near to the pistes of the French resort of Les Menuires it is available on a Room only basis. The property also features a TV and Wifi. Offering holiday accommodation in Les Menuires on a Room only basis, Le Median is a 1 bedroom apartment that can comfortably accommodate 6 people. The property also features a TV and Wifi. Conveniently located near to the pistes of the French resort of Les Menuires. Le Sarvan has 1 bedroom and can accommodate upto 4 people on a Self catering basis. This apartment also features a TV and Wifi. This 1 bedroom apartment is located in the French resort of Les Menuires. Available on a Room only basis, Les Carlines 1 can sleep upto 4 people. This apartment also features a TV and Wifi. LAstragale is located in the French resort of Les Menuires. This apartment has 1 bedroom and can accommodate upto 4 people on a Self catering basis. The property also features a TV and Wifi. Conveniently located near to both the piste and centre of the French resort of Les Menuires. Les Burons has 1 bedroom and can accommodate upto 5 people on a Self catering basis. This apartment also features a TV and Wifi. A 2-bedroom apartment which can sleep 7, situated in the resort of Les Menuires in France. Pelvoux has a TV and Wifi, and is available for holiday rent on a Room only basis. A 2-bedroom apartment which can sleep 7, situated in the resort of Les Menuires in France. Brelin has a TV and Wifi, and is available for holiday rent on a Room only basis. Les Soldanelles is located in the French resort of Les Menuires. This apartment has 1 bedroom and can accommodate upto 4 people on a Room only basis. The property also features a TV and Wifi. Conveniently located near to the pistes of the French resort of Les Menuires. Gentianes has 1 bedroom and can accommodate upto 4 people on a Room only basis. This apartment also features a TV and Wifi. This 1 bedroom apartment is located in the French resort of Les Menuires. Available on a Room only basis, LArgousier can sleep upto 4 people. This apartment also features a TV and Wifi. This 1 bedroom apartment is located in the French resort of Les Menuires. Available on a Self catering basis, Le Sorbier can sleep upto 4 people. This apartment also features a TV and Wifi. Le Genepi is located in the French resort of Les Menuires. This apartment has 1 bedroom and can accommodate upto 3 people on a Room only basis. The property also features a TV and Wifi. Featuring a TV and Wifi, Les Origanes offers comfortable holiday rental accommodation in Les Menuires on a Self catering basis. Les Origanes is a 2 bedroom apartment that can comfortably accommodate 6 people. A 2-bedroom apartment which can sleep 6, situated in the resort of Les Menuires in France. LOisans has a TV and Wifi, and is available for holiday rent on a Self catering basis. A 2-bedroom apartment which can sleep 6, situated in the resort of Les Menuires in France. Aravis has a TV and Wifi, and is available for holiday rent on a Self catering basis. This 1 bedroom apartment is located in the French resort of Les Menuires. Available on a Self catering basis, Chanteneige La Croisette can sleep upto 5 people. This apartment also features a TV and Wifi. Conveniently located near to the pistes of the French resort of Les Menuires. Les Alpages de Reberty has 2 bedrooms and can accommodate upto 6 people on a Room only basis. This apartment also features a Pool, Sauna, TV and Wifi. Caron is located in the French resort of Les Menuires. This apartment has 3 bedrooms and can accommodate upto 9 people on a Self catering basis. The property also features a TV and Wifi. Offering holiday accommodation in Les Menuires on a Room only basis, Residence Les Clarines is a 3 bedroom apartment that can comfortably accommodate 8 people. The property also features a Pool, Sauna and Wifi. Chalet Les Marmottes is a 7 bedroom ski-in ski-out apartment that can comfortably accommodate 16 people. Located in the French ski resort of Les Menuires it is available on a Self catering basis. The property also features a Sauna, Fireplace and TV. A 2-bedroom ski apartment which can sleep 9, situated in the ski resort of Les Menuires in France. Available for holiday rent on a Self catering basis. Offering holiday accommodation in Les Menuires on a Self catering basis, Chalet De Sophie is a 5 bedroom ski apartment that can comfortably accommodate 14 people. The property also features a Fireplace and TV. Conveniently located near to both the piste and centre of the French resort of Les Menuires. La Croisette has 1 bedroom and can accommodate upto 6 people on a Room only basis. Featuring a Pool, Sauna, Fireplace, TV and Wifi, Les Montagnettes offers comfortable holiday rental accommodation in Les Menuires on a Room only basis. Les Montagnettes is a 6 bedroom chalet that can comfortably accommodate 11 people. This 1 bedroom ski apartment is located in the French resort of Les Menuires. Available on a Self catering basis, Residence Les Combes can sleep upto 6 people. This ski apartment also features a Sauna and TV. Featuring a Fireplace and TV, Hotel Neige et Ciel offers comfortable holiday rental accommodation in Les Menuires on a Half board basis. Hotel Neige et Ciel is a 1 bedroom ski hotel that can comfortably accommodate 5 people. Featuring a Pool, TV and Wifi, Residence Soleil Vacances offers comfortable holiday rental accommodation in Les Menuires on a Room only basis. Residence Soleil Vacances is a 1 bedroom apartment that can comfortably accommodate 6 people. Offering holiday accommodation in Les Menuires on a Self catering basis, Residence Les Valmonts is a 2 bedroom ski apartment that can comfortably accommodate 8 people. Offering holiday accommodation in Les Menuires on a Self catering basis, Residence Le Hameau des Airelles is a 2 bedroom ski-in ski-out apartment that can comfortably accommodate 6 people. The property also features a Fireplace and TV. This 1 bedroom apartment is located in the French resort of Les Menuires. Available on a Room only basis, Brelin can sleep upto 6 people. Featuring a Pool, Sauna, TV and Wifi, Le Coeur des Loges offers comfortable holiday rental accommodation in Les Menuires on a Room only basis. Le Coeur des Loges is a 2 bedroom apartment that can comfortably accommodate 6 people. Offering holiday accommodation in Les Menuires on a Self catering basis, Premium Les Alpages de Reberty is a 3 bedroom ski apartment that can comfortably accommodate 10 people. The property also features a Pool, Sauna, Fireplace and TV. Residence Chanteneige Croisette offers comfortable holiday rental accommodation in Les Menuires on a Self catering basis. Residence Chanteneige Croisette is a 1 bedroom ski apartment that can comfortably accommodate 4 people. A 2-bedroom apartment which can sleep 8, situated in the resort of Les Menuires in France. Les Chalets de lAdonis has a Sauna and Wifi, and is available for holiday rent on a Room only basis.